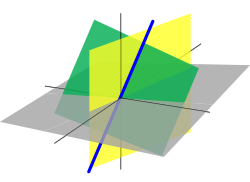 The three-dimensional Euclidean space R3 is a vector space, an lines an planes passin through the origin are vector subspaces in R3. Linear algebra is the branch o mathematics concernin vector spaces, eften finite or coontably infinite dimensional, as well as linear cairtins atween such spaces. Such an investigation is initially motivatit bi a seestem o linear equations containin several unkents. Such equations are naiturally represented uisin the formalism o matrices an vectors. ↑ Weisstein, Eric. "Linear Algebra". From MathWorld--A Wolfram Web Resource. Wolfram. Retrieved 16 April 2012. This page wis last eeditit on 28 Dizember 2013, at 16:41.